(all the icons are from openclipart, so they are public domain. Well, I made the “man at work” icon into a “woman at work” icon, which I hereby release into public domain if you really care). !!! the bad part: inkscape doesn’t let you create links out of individual words, and also (I think) has issues exporting those links to the PDF form, so take it as you wish. also, I recommend writing your text up first, because editing text in inkscape can be very slow. 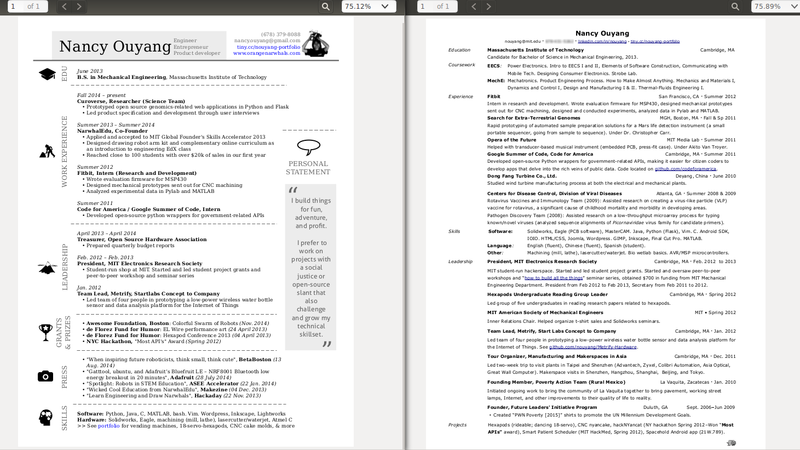 I added a personal statement and the “keyword roles” (both blocked out in grey), since people at bigger companies (hi Apple) get confused when trying to pigeonhole me into an Employee Role. Use a google voice number instead of my actual number, it’s just sensible to do so. More whitespace! All hail whitespace! MAJOR Caveat: I’ve yet to get a job based on my resume or portfolio. ^^; At this point, I sink time into them as “information design” / “graphic design” exercises, for fun. I am interviewed for and accepted for jobs (contract, full-time, or internship) the normal way: networks (the MIT network is pretty strong) and through projects / work I’ve done. After talking to a few people, everyone agrees the new version looks better. For instance, when I think of MITers, “student-run shop” is pretty much the blandest possible description of the place. When I think of MITers, I think of people voiding warranties to make things that are amazing. I think of people throwing caution to the wind and making cool things because they can. And as the president of MITers, I envision you as a bull-rider with a gentle touch — you have to let the crazy happen, because that’s the magic of the place, but you still have to keep things under control.